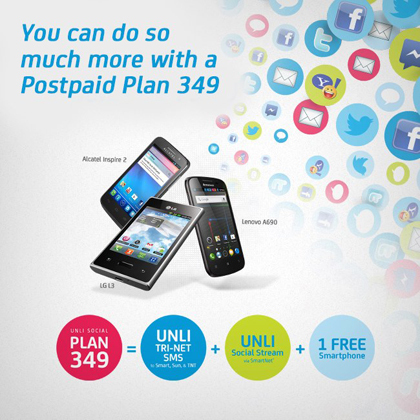 You can do so much more with Smart Postpaid Unli Social Plan 349! Enjoy unlimited tri-net SMS, unlimited Social Stream with Smartnet, and get a FREE smartphone for only Php 349 a month! Unli Social Stream is powered by SmartNet, you can check your Facebook AND Twitter accounts in one go! See all your news feed updates in one screen with a single touch of your phone. Take all your friends with you anywhere you go, unlimited on Plan 349. Unli Social Stream is a FREE applications on your smartphone that allows you to be socially active online. *Facebook, YM, and Twitter will be unlimited if used through the app, SmartNet. For mobile internet, you get charged P10 for 30 minutes in a mobile browser. Facebook or Twitter apps will be charged P10 for 30 minutes. For more details about Smart Postpaid Unli Social Plan 349, please visit Smart Communications website and Facebook Page. You can also visit UnliPromo Facebook page (www.facebook.com/UnliPromo) for the latest promos, sales and updates.